Disclaimer: The Plussound Tri-Copper cable sent to us for the purposes of this review is a sample and does not have to be returned. Thank you to Plussound for giving us this opportunity. After a brief flirtation with the EXO BT series and the Cloud 9 amp, we finally take the plunge and review one of Plussound’s core products, their cables. 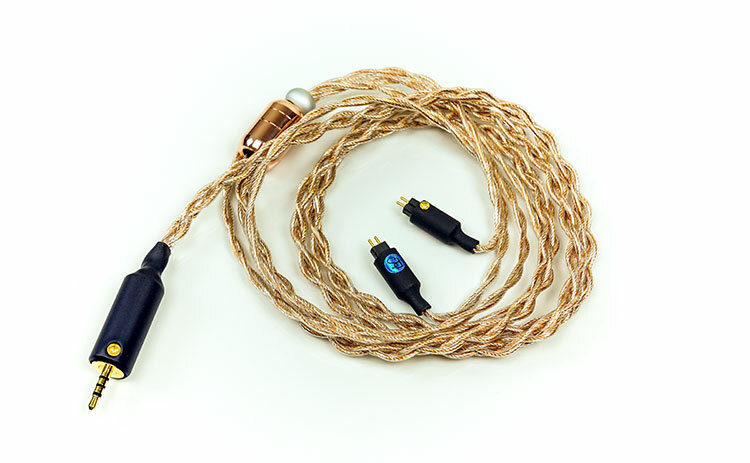 Plussound made their name with aftermarket cables so it only made sense to talk to them more about their new Tri-Copper cables series, of which the one being reviewed here is the 4-wire Exo series variant. The discussion initially was about their new PS insulation which Christian and the team felt was a definite upgrade on their older jackets. However, it became clear you cannot just review a jacket so in comes the Tri-Copper pitch. What is so unique about this cable? The clue in the name. This has 3 different types of copper wire, all blended into one cable. To be perfectly clear the Tri-Copper option is not exclusively an Exo series cable. 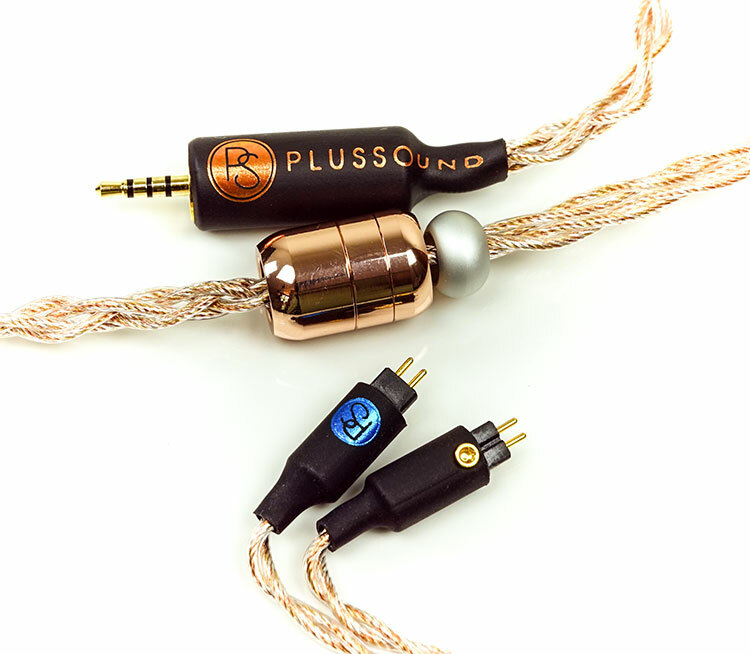 Plussound have made the Tri-Copper wire available in a number of configurations including their top of the line X8 series of cables which is an 8-wire design. At $549 the Exo variant is the lowest cost cable that you can avail of the Tri-Copper wire option. There are four cable product ranges that are higher than the Exo that offer Tri-Copper including the Poetic, X, X6 and X8 series up to $1099. The cable is clearly pitched to copper wire enthusiasts but with a twist. Typically, you get a wide range of copper finishes such as OFC, SPC, and gold-plated OFC but each in their own jacket. The difference this time is this the use of UP-OCC copper, silver-plated copper and gold-plated copper all in a single wire. The mix of each, according to Plussound, will produce a unique sound. Each element typically has their own electrical properties and ultimately it depends on the level of the mix but you can be sure the dominant material is copper. Silver plated copper tends to generally produce a little bit more energy and sparkle into the presentation. Pure copper is viewed, more often than not, as offering the best body and texture in a cable, particularly on the low-end. Gold is seen as the worst conductor of the three. However, a tiny dab of gold (plating) can also help attenuate any high-frequency issues. Ideally, this should produce a perceptibly smoother top-end, particularly on lower gauge wire which tends to exhibit higher levels of resistance. This has been done before on a cable we reviewed very recently called the Libra from Astral Acoustics though their base material was silver. Despite the mix of copper, all the wires have the same Type 6 Litz configuration. Now, type-6 is a fairly marked step-up from type-1 and 2. The configuration is certainly a lot more complex as it features bundles of type-4 wire twisted around a fiber core whereas Type 1 and 2 wiring has no individual cores. Each type-4 wire has their own core which acts as a dampening element to reduce vibration, regulate consistent conductivity as well as generally produce a better feel when handling. Generally speaking, Litz is an excellent wire for reducing the level of resistance, especially on lower gauge variants. Their lack of material depth and excellent insulating properties means they do a better job than most reducing the skin and proximity effect on typical non-Litz wiring. 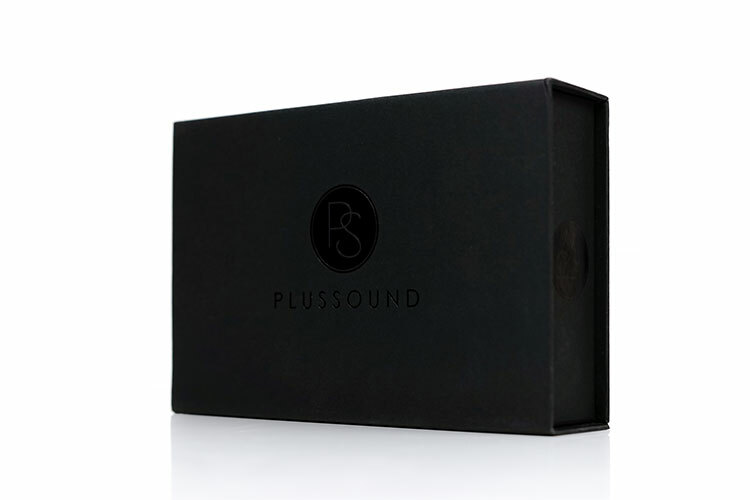 Plussound have chosen a 26AWG for their Litz 6 configuration. 26Awg is a fairly light strand composition in terms of threading size with an approx 0.405mm diameter and 62.7 turns of wire. However, with the use of Litz 6, the inherently higher levels of resistance in the smaller gauge level should be much less of a factor in the Exo Tri-copper performance. This pretty similar to how Effect Audio have been able to drop down to 26AWG without a drop in performance of their copper hybrids due to the mix of Litz wiring. The look and feel of the Tri-Copper Exo build really stands out for me with its bold coloring choices. 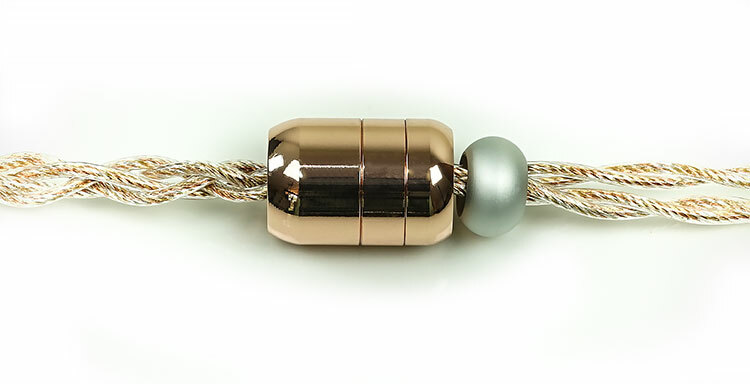 This is a 1.2m tightly braided cable flush with a rose gold hue, both in the cable itself and the y-split barrel. Our photos came out looking a touch more gold than rose gold but I promise you this is no regular copper or white/silver scheme. The barrels are finished with the usual red and blue markings with the PS motif and all terminations are wrapped in a heat-shrunk and grippy branded black finish. The only part that sticks out for bucking the homogenous coloring is the cinch which is an odd silver finish. Personally, I would have loved it to be carved from the same rose pink y-split barrel for a lower profile. The pliancy is excellent and on par with similarly priced offerings from Effect Audio and a notch up on the heavier or stiffer cables from OC Studios and ALO. Granted my OC Studios are 24AWG but you can tell the jacket is made of a stiffer material right away. 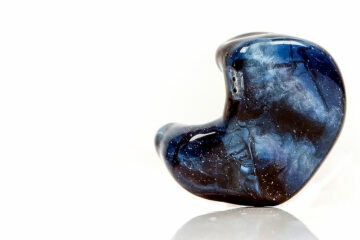 The level of microphonics is also excellent on the Exo Tri-Copper, this is a very quiet cable during use. If you have handled the Lionheart before then the Tri-Copper has much the same consistency in handling with a slightly dense but lightweight feel to it in your hand. It will never tangle and has just enough weight to prevent it from being bouncy or “fly away” which is something I found in the cheaper Taurus from Astral. The Tri-Copper does have the same feel as the Libra flagship jacket from Astral Acoustics. The Libra uses a PVC jacket having switched from PET recently. Now, Plussound has not explicitly stated PVC is their new material and will not reveal it. Instead, they call it “PS Insulation” and it is exclusively used on their Type 6 configurations replacing their older polyethylene insulation. Well, how long is a piece of string? You can have a variety of terminations for the Tri-Copper Exo series cables. The choices they provide are excellent. This particular one is sporting a 0.78mm 2-pin connector with a 2.5mm balanced TRSS jack termination. You can also order an additional short throw adapter for 3.5mm or 4.4mm should you require it or have the cable terminated in any of these options including an additional 3.5mm balanced jack. Should 2-pin not be your flavor Plussound can offer up to 11 other types including MMCX, Fitear, 0.75mm and extruded 0.78mm (UM) to name but a few. All connectors are finished in the same pure gold-plated copper with anodized aluminum shells and a black finish. Note the motifs are red and blue to denote channels on each connector. All strain relief on the Exo Tri-Copper connectors and y-splitter barrel are housed internally. In summary, you will not see any protruding plastics on the terminations. The central rose gold colored y-split barrel is short but stubby and also quite light for anodized aluminum. The cinch is made from similar materials but clashes a little with the rose finish of the y-split barrel. It should really be the same finish and shape for me on this sample. You can, however, tailor your strain relief and barrels with up to 12 options for the barrel and 6 options for the cinch before you buy depending on your preferences so the options to color code are there. There is also no additional memory wire plastics or heat-shrink materials on the Tri-Copper. The cable will wrap nicely around your ear without having to make adjustments. It has a nice balance of density/weight and pliancy to hold in place without resorting to memory retention tools. The packaging on the Tri-Copper has had a minor change compared to the previous box received for the Exo BT series cable. The plain magnetic latched black cardboard box now has a printed sleeve showing a cable design on top which slides off from the package. The previous instructions card has now shifted to the back of the box which might save a little in terms of additional printing costs but it is a touch harder to read as a result. You will know which cable you get from the supplied invoice when purchasing. Those who purchase from distributors and dealers have labels on the packaging to indicate specs. Aside from that, the contents of the box have not changed from our previous review with a set of branded rubber straps and the cable sealed in a plastic bag. 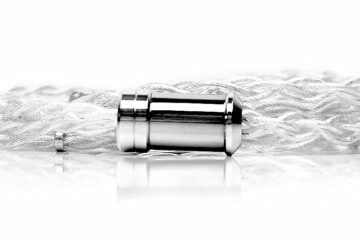 It is an ok package, nothing out of the usual, however, I would love to see an IEM strap for holding the cable included and a warranty card or something similar. Also, with the new design, the website could do with an update as it still states the inclusion of the information card which is now not the case.